It may take your Deac a few days (or more) of rest and TLC at home to get back into the groove of family life. 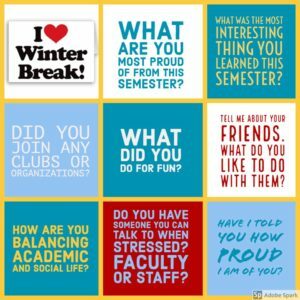 But while they are home for break, you might consider having some conversation about your student’s semester. This can help your Deac reflect on their experiences, while helping you feel connected to their time on campus. The only rules to these conversations are: listen more than talk, and listen without judgment. One of my counterparts at another school shared this graphic on our professional listserv and encouraged us to share it with our respective parents/families. So without further ado, here are some of the questions you might ask or topics you might cover.